Whether you have a green thumb or not, introducing the basics of gardening, nature and fresh vegetables into your early childhood program can have a positive effect on your students, parents and staff. 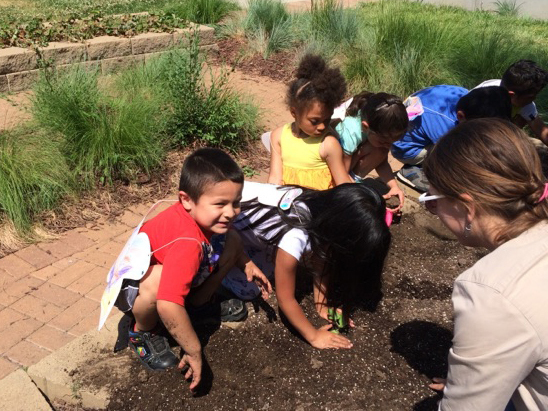 Gardening programs, like many Educare schools run, are a great way for children to experience nature and science by exploring how things grow and where food comes from. They also offer opportunities for lessons in math, language, social interactions and cultures. Here are some tips from our Educare staff for how to make your program’s garden grow. Find a community partner. You don’t have to be a gardening expert to have a great garden. Check for organizations in your area who specialize in helping programs and nonprofits create and sustain gardens. Bring gardening into the classroom. You can encourage children’s engagement with the garden inside the classroom, by studying plants and foods and reading related books. One idea is to read Jack and the Beanstalk, and have children plant, estimate, measure and document their own beanstalk’s growth. Involve your families. Gardens are a great place to bring children, staff and families together. Children will enjoy taking their families on a walk through their garden. You can also make garden harvests available to families or offer cooking classes for parents. Let children explore. They can take their magnifying glasses into the garden and discover insects living in the dirt and among the plants. Encourage grazing and nibbling as children visit and work in the gardens. Learn how Educare is promoting science in early education.